The auto glass materials may look like a regular window, but it’s far from normal glass. Automotive windows are materials that are installed on the body of a vehicle. Therefore surrounding the passengers, this includes the side and rear windows, windshield, as well as the glass panel roofs. Windshields are specifically designed to provide safety for everyone in the vehicle. for the driver and passengers inside the vehicle. Today, car manufacturers are using high-end technology producing advanced windshields. This will greatly improve the safety standards of the vehicles they produce. Not only safer, but these parts are also easy to recycle. The windshield is a reflector that is located in front of the vehicle. Therefore designed for protecting you from the wind, that’s also the reason why the windscreen was invented in the first place. Now the windshield has vital functions that have become vital. Windshields are actually supporting the whole roof of the vehicle, so in case the vehicle turns upside down, it’s mostly the windshield that’s preventing the roof from caving in. When a collision happens, the windshield will protect you from the outside objects, also it prevents you from being ejected out of the car. This explains why windscreens must be made with top quality auto glass materials and must be installed appropriately. The installation of a new windshield should meet the AGRSS safety standards. AGRSS stands for Auto Glass Replacement Safety Standards, this is a nonprofit organization that sets the standards of auto glass safety. 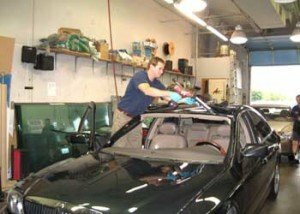 Therefore whenever you’re looking for an auto glass shop to get a windshield replacement, you have to be sure that the shop and the auto glass technicians have the AGRSS certification. Automobiles will deal with various kinds of environmental tensions, weather conditions, and unexpected incidents. That’s why quality materials and high installation standards are a must. It also means the auto glass is not the same with regular glass, they are much stronger and have lots of features that regular glass don’t have. Generally, there are two kinds of auto glass being used in today’s automobiles, laminated glass and tempered glass. Windshields are using laminated glass, this is the kind of glass that’s extremely tough and not easily broken. It’s designed to withstand the weather and also hard impacts, the main idea is to provide optimum protection and prevent any outside object from going through the windshield and hurt the people inside the vehicle, on the other hand, it also prevents anyone from being thrown out of the car in a collision. The second type is tempered glass. This kind of auto glass is more than 10 times stronger than regular glass but still not as strong as the laminated glass. The reason is to provide an emergency exit in case you are trapped in the car after an accident. When you break the tempered glass, it will break into tiny pieces without any sharp edges. Tempered glass is used for side and rear windows.